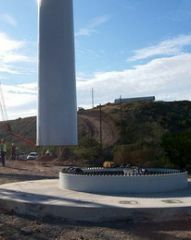 Whether it’s a wind turbine tower, a solar panel, hydro power or other renewable energy sources, we specialize in effective and environmentally friendly foundation solutions. For wind turbine towers, we have developed a deep foundation solution that has a smaller footprint than traditional mass foundations. To resist the imposed overturning moments, the concept relies on the activation of the soil mass under the foundation using post tensioned ground anchors. This reduces the diameter and thickness of the foundation cap, resulting in a dramatic decrease in the need for reinforced steel and concrete. We expect to receive Germanischer Lloyd certification for this foundation in 2010. Another advantage of our deep foundation system is that it is scalable for turbine sizes beyond 2.5 MW, which are today’s standard. At 3 MW or higher output and with tower heights exceeding 80 metres, mass concrete foundations become uneconomically large. The most common foundations for solar panels are piled foundations. Our CTS/Titan hollow bar system is ideally suited for such foundations because it can be used in a variety of ground conditions. No change, other than the total length of the pile, is required when going from one ground condition to the next. These foundations are installed using relatively small equipment (e.g. excavator mounted drifter and a grout plant) and there is no need for concrete. In terms of hydro power, dams or weirs are commonly required. These structures may be built using the mass of the structure to resist the water pressure or by using a deep foundation system. For deep foundation systems, strand anchors are often economical. They can be easily scaled to the required load and they establish a redundant system due to the multiple tension elements. Many of the geo-support systems we have pioneered for the renewable energy industry have been successfully applied to novel foundation designs. Interested in knowing more about our products and solutions for renewable energy sources? Contact us today.